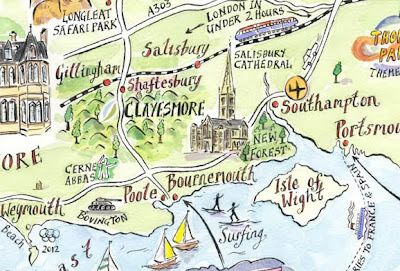 I was asked a couple of weeks ago to produce a map for Clayesmore School in Dorset. The school were looking at a new marketing tool that would encourage children to want to come to the school not just from England but from all over the world. The school came up with a treasure tin that would include items that the children would like to keep and look at, included in the tin was the illustrated map show the location of the school its close! proximity to London and also show some of the locations students may visit while at the school. I await to see how the map looks printed and folded in the tin.